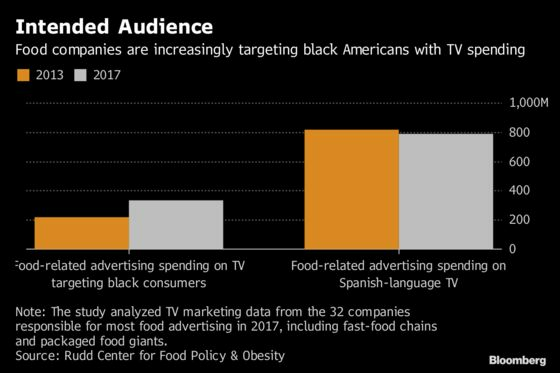 (Bloomberg) -- Food companies have ramped up spending on TV commercials targeting black consumers while simultaneously cutting back their overall spending on advertising, according to a new study. During a five-year period when both total and Spanish-language TV advertising by food companies fell 4 percent, TV marketing aimed at black Americans spiked more than 50 percent, according to a report from University of Connecticut’s Rudd Center for Food Policy & Obesity. Black teenagers saw more than twice as many ads for unhealthy foods compared to white teens in 2017, the study found. Both fast-food chains and packaged food companies increased their spending for the demographic group during the period from 2013 to 2017. According to the study, PepsiCo Inc.’s spending on TV commercials targeting black shoppers rose by 37 percent, while Taco Bell-owner Yum! Brands Inc.’s rose 31 percent. The companies did not immediately reply to a request for comment. As food companies and restaurants fight to win over U.S. consumers, ads targeting youth and minorities have come under scrutiny and been linked to rising obesity rates. The obesity rate for U.S. children has risen across the U.S. and now stands at about 18.5 percent. It’s higher for black and Hispanic children, according to the Centers for Disease Control and Prevention. Hershey Co. was the only large advertiser to reduce spending that targeted black consumers, the study found. In 2010, then First Lady Michelle Obama launched the Let’s Move campaign, with the goal of lowering the U.S. rate of childhood obesity to 5 percent by 2030. At the time, the campaign highlighted food and beverage companies as “key actors” in preventing obesity. The study analyzed television marketing data from the 32 companies responsible for most food advertising in 2017. It analyzed channels with a target audience of black Americans, including BET and VH1.